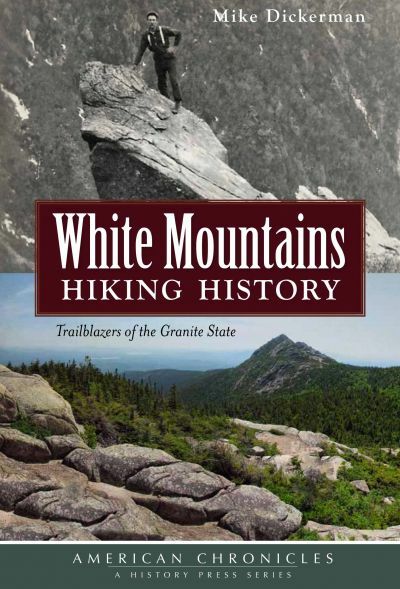 White Mountains Hiking History: Trailblazers of the Granite State, by Mike Dickerman, 2013. Longtime northern New Hampshire hiking columnist and guidebook author Mike Dickerman retraces the steps of the early mountain guides and path-builders who helped create the extensive hiking trail system in New Hampshire's White Mountains. Starting with the legendary Crawford family in the early 1800s, and continuing through the great path-builders of the early 1900s, the author traces this evolution with a series of profiles of trailblazers such as Allen "Old Man" Thompson, Charles E. Lowe and the Goodriches of Waterville Valley, as well as stories of the Fabyan Bridle Path, Kinsman Notch, North Woodstock Improvement Association, an 1879 journey through te Zealand Valley, and other fascinating topics. The last chapter features an extensive compendium of early mountain guides and trail builders. Illustrated with more than 50 images. 144 pp., 6" x 9."